Welcome to the week’s update from CSE, where we go over the week’s highlights in the form of our Top Tenish list, show off a bit of art, and talk about the week’s progress! We’re also catching up on quite a few thank-you’s from gifts that some of our wonderful Backers sent us leading up to the start of Beta 1. Besides important-but-unsexy things like our security update and moving players automatically between proxies, we have a lot of cool things we’re moving forward on, including updating our deathmatch castle with a version built by our Builders’ Brigade in C.U.B.E. and upcoming changes to visualize stability on buildings! Let’s jump to the Top Tenish to get a better look at what we’ve been up to! Testing: We plan to have a two part test this weekend, first to test our new authentication system (described in the next item) and then general testing. Once we get through this test, we can move forward with more fun changes coming for next week. We’ll send out a separate email with details. Tech – Proxy Migration: Colin got the work into review that will allow us to bring down unneeded proxies and migrate players to those proxies still running. From a player perspective, they shouldn’t even notice the change. WIP – Tech – Stability Visualization: While Matt spent most of this week helping land the new authentication system, he’s also trying to get in visualizations of stability on buildings. His first pass will be a green, yellow, orange, to red color-coding system, denoting the amount of force upon the block. WIP – Design: Ben is finishing up his first-pass design of mage skills. Once this is finished and approved, we’ll be moving forward with the ability system, animation, VFX, and SFX work needed to support mages. That support should also help improve the work we’ve done on our B1 archetypes to support the classes we have planned for CU. WIP – Tech – Portals Visually Display Status: Colin began work allowing us to visually show players when a portal is active or not, which will help reduce player confusion when moving about the world. Tech – Item update Batching / Progression Tracking / Item Logs: Christina is jumping around this week, being productive as ever. Worked on a system for batching together low-priority item updates to cut down on how much and how often we need to run item transactions. Added progression tracking for curing and applying wounds to other characters. 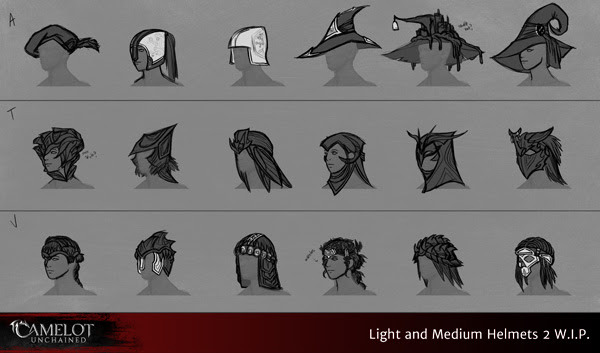 Art – Concept – Light and Medium Helmets: Sandra completed no less than seven pages of helmets, from which we will choose our favorites to make. WIP – Art – Pauldrons: Jon has been steadily working through a long visual list of pauldrons, and has currently completed high and low poly modeling of over 27 items. WIP – Art – Characters 2.0 – Proportions: The art team has discussed several improvements we’d like to make to our basic human male and female models. We moved forward with that this week, based on concepts sculpted by Jon. 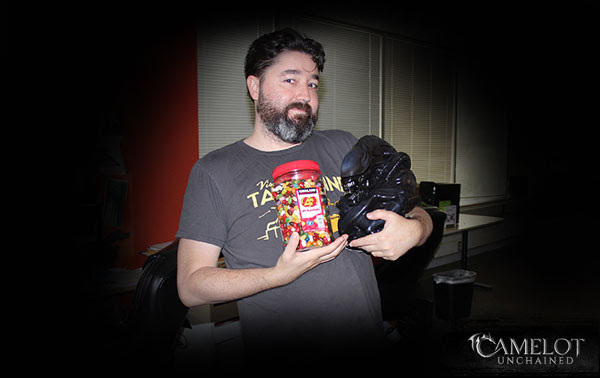 Next week, Jon will shift from pauldrons to the higher-priority task of improving the overall characters. 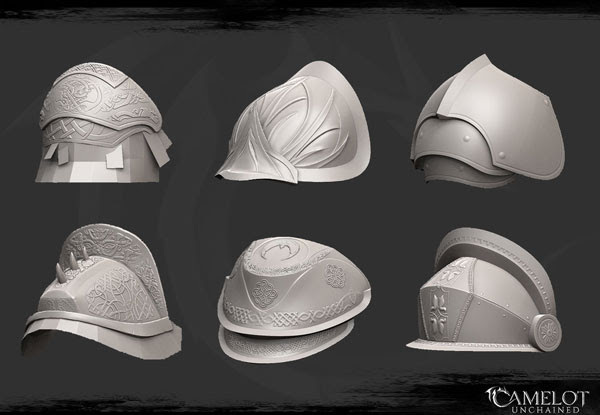 WIP – Art – Characters 2.0 – Topology: The art team, and specifically the animators, have discussed several changes they’d like to make to the way we build our characters. With an approved update to the proportions of the characters, the next thing is to improve how the meshes deform when animated, while remaining within total poly budget. WIP – Art – Animation Improvements: Scott has been wrapping up some prototyping work to improve the look of animations when shortened and lengthened through the ability system. We’re working with quick melee attacks, as they are the most difficult. Systemically, this is meant to work with all types of abilities, from casting to bandaging. WIP – SFX/Music: Like characters 2.0, we’re auditing what we may need to better support dB. While assisting that process, dB is importing new combat music, mixing current tracks, and improving the transition from ambient music to combat music tracks. WIP – VFX and Lighting: Mike did some auditing this week of lighting values because of our improved lighting changes. He’s finishing up the week adding VFX to several fountain models Dionne created. I’m (Tyler) totally digging on replacing those old crappy castle pieces I made ages ago. They will be replaced not only with something our Backers made, but a construction that takes us another step toward an epic castle siege! Time to jump into art! If you remember the update from last week, Dionne created a fairly large fountain. One of the requirements of games, especially ours, is getting the most out of your assets, and also your time. 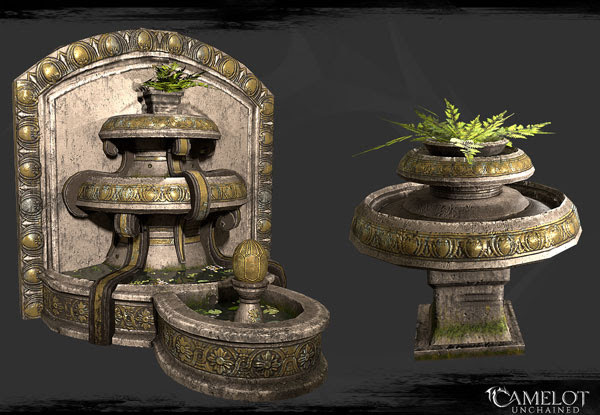 Dionne created two more variations of that fountain using the same resources. 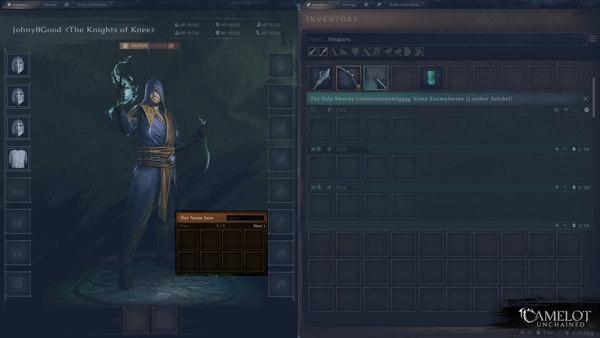 James has been working on an addition to the inventory window that allows you to select a slot on your paper doll and quickly see what gear would fit it. 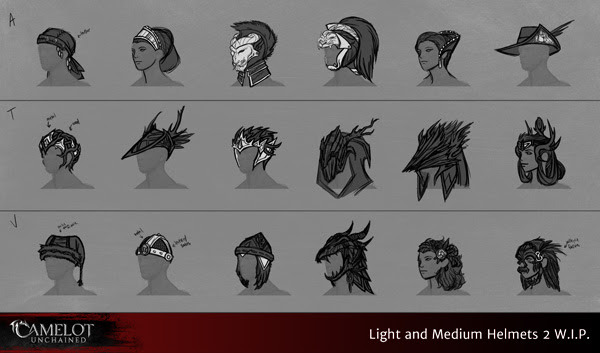 We mentioned the numerous helmet concepts Sandra has been working on in the Top Tenish above. Each row of these is broken down by Realm, with Arthurian in the top rows, then TDD, then Viking. Here we have the models for a Viking Tavern and Bank. 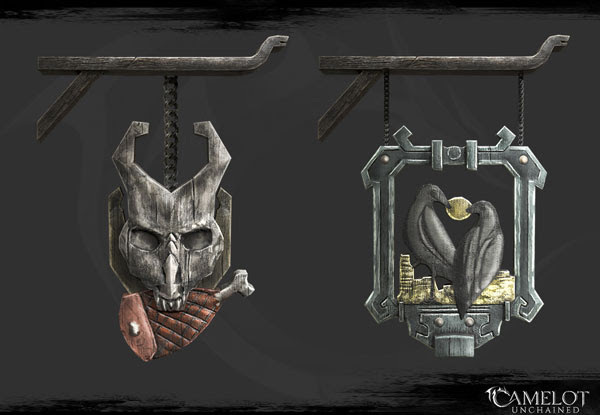 You can find these currently on Midgard, the Beta 1 Viking home island. That wraps up art, which means I need to finish off the thank-you list I started last week. 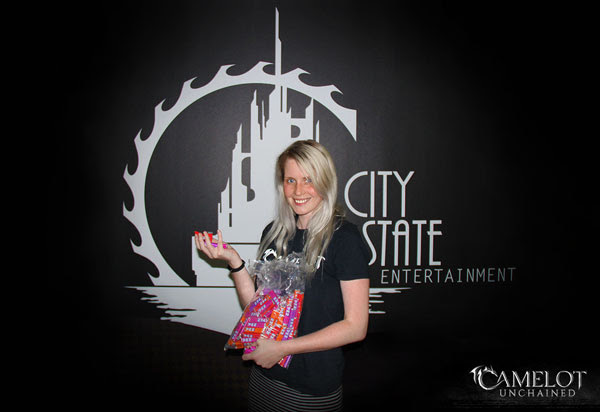 To re-iterate, we had several gifts sent to us during our run-up to the start of Beta 1! First off, we have this totally amazing, totally epic, Alien cookie jar sent to us (but mostly to me – Tyler!) by Ludovic. He even sent over a couple of big jars of Jelly Bellies. If only I’d been wearing my Weyland-Yutani shirt when this photo was taken! Next, we received this creepy inquisition hood from Poxer for a Morning with Max hat. Here’s Max showing it off! Also, our Rich Creepy Uncle sent both teams a pizza lunch. Unfortunately, we pretty much gobbled it all down before we thought to get a photo! Thanks very much for the great lunch! Ludovic, knowing how much Michelle loves Pez, sent just enough to tide her over for a week or two. 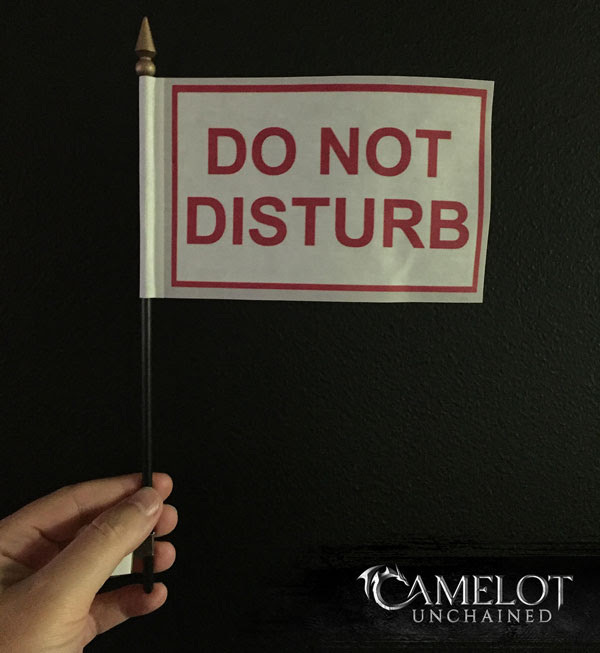 This week, we received this flag from Ludovic, for Ben, who mentioned he likes to really concentrate to get his work done. I think Ludovic wants Ben to get those mages designed! 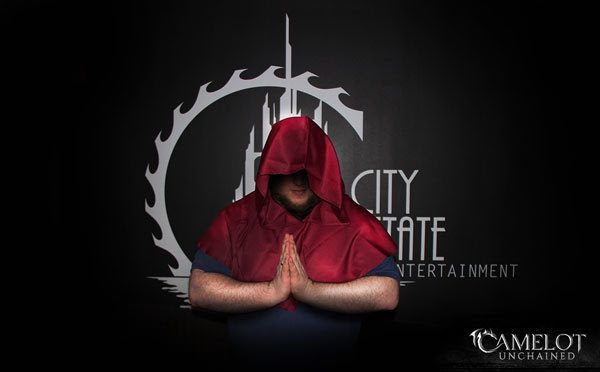 We truly have a great Community, and we are ever-thankful for the gifts. While never necessary, they are much appreciated.